Take your bathroom singing and humming to the next level while having a blast with your friends. Harry’s Karaoke Lounge Bar offers karaoke nights on all nights except Tuesday along with entertaining the crowd with live performances. Along with the massive bar menu, the cuisine ranges from Mediterranean, Chinese and North Indian delicacies. For the avid music lovers, this venue is one of the finest option to have a musical and fun evening with your friends or loved one. The in-house bands will blow your mind away with the numbers from golden rock era to the latest ones. The variety of beer and other concoctions along with awesome food makes Legends of Rock the ultimate spot while you are at Bangalore. The absolute among karaoke club in the city offers karaoke and live gigs to the audience along with wide range of drinks and food. The choice of songs varies from Hindi to English and Tamil. Cascades at Novotel organizes karaoke nights for the guests along with delicious food and exciting beverages. Have a fun filled evening by singing your heart out along with your gang. 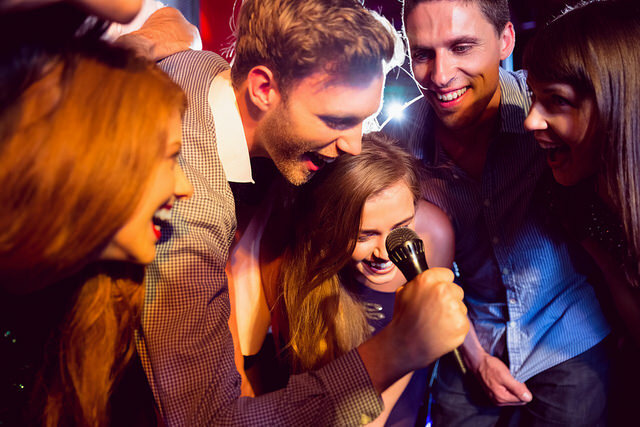 RepubliqIn mobile app is one amazing application that helps you find the best karaoke pub and bars with great ease. Make your holidays memorable or spend a musical and fun night with your loved ones and enjoy access to the best of drinks too with our app.